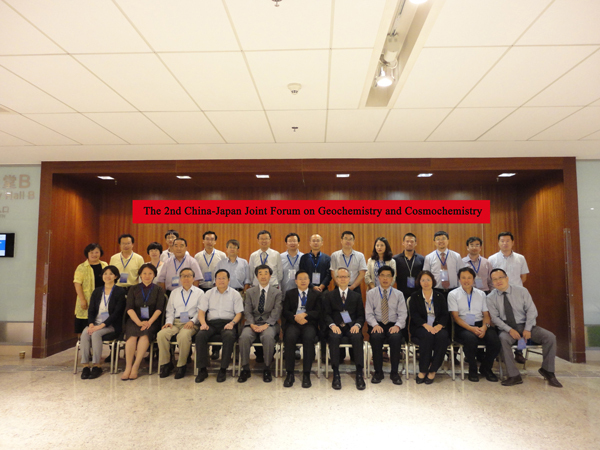 The 2nd China-Japan Joint Forum on Geochemistry and Cosmochemistry was held at China National Convention Center Grand Hotel in Beijin on 24th of September in order to promote the scientific communication between both societies. Since the 1st joint symposium of Geochemical Society of Japan and the Chinese Society for Mineralogy, Petrology and Geochemistry (CSMPG) was held at Toyama University (Professor Jing Zhang) last year, we had a friendly atmosphere this year. Seven Japanese and nine Chinese scientists gave scientific presentation. The leading experts on geochemistry and cosmochemistry from both countries had a fruitful discussion. We will develop our research collaboration in future based upon MOU between both societies. This year CSMPG hosted the Forum and Japanese members would like to express their deep gratitude to Professors Congqiang LIU (center in the front row), Ruizhong HU (the fourth from the right side in the front row) and Yun LIU (the third from the right side in the back row) much for their kindness.